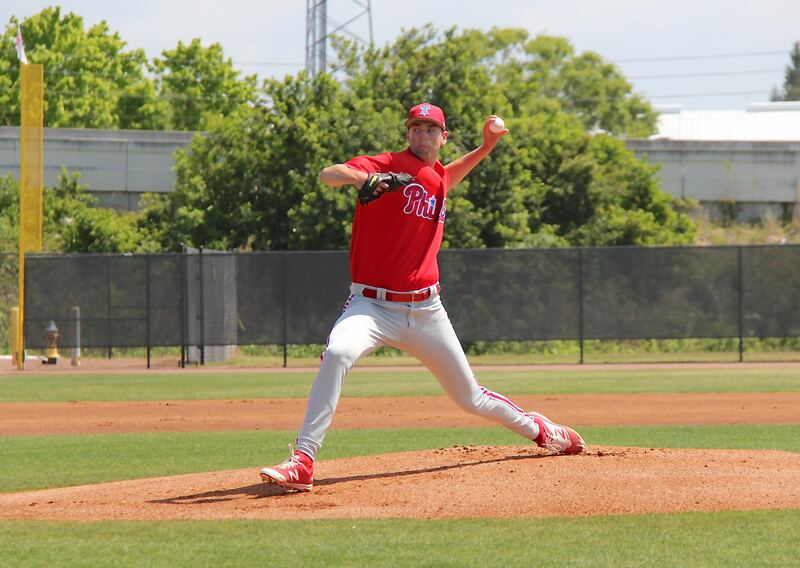 Jake Arrieta pitched today in a Grapefruit League game. He threw two innings and gave up 2 runs on 3 hits including a HR and struck out two. He didn’t walk or hit anyone. His fastball sat 93 mph, touching 95, his curve was 81-83, and his slider was 87–89. 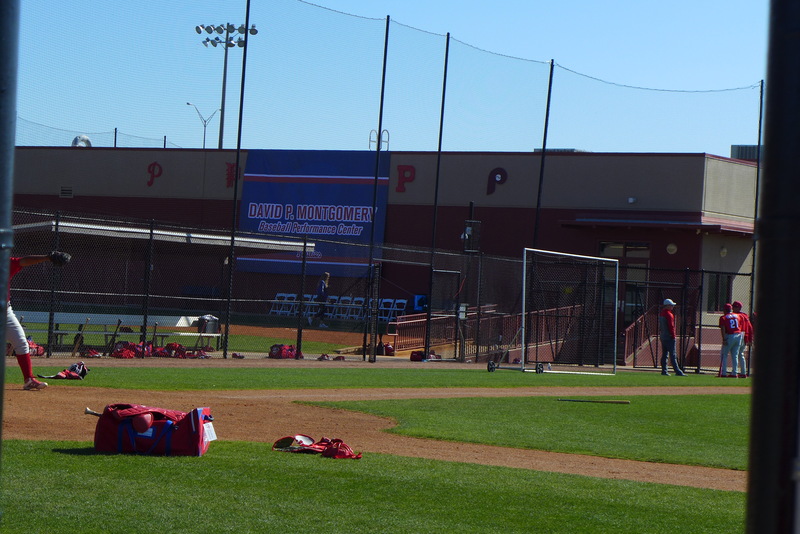 In the morning at the Complex, the Phillies unveiled the David P. Montgomery Baseball Performance Center. 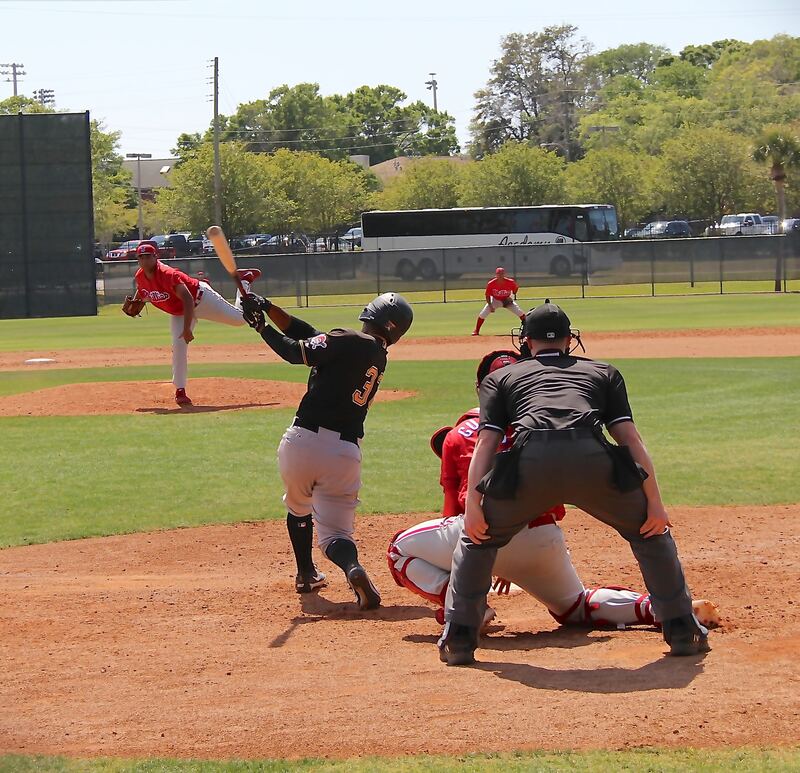 The surprise presentation was unveiled in front of all the players, coaches, guest instructors, front office employees, and media present in Clearwater. It has been a few days since I last reported. I didn’t go to the Complex on Tuesday when rain forced the cancellation of the day’s games (although morning intrasquad games were substituted). 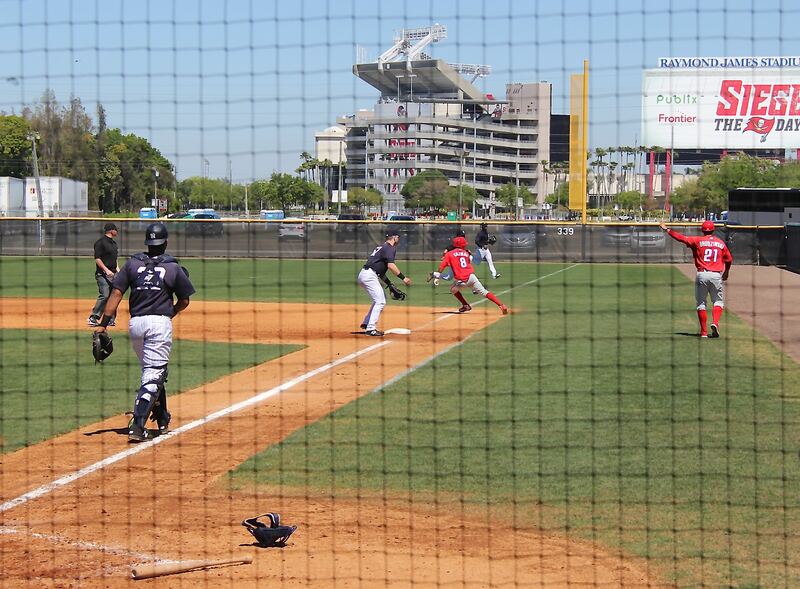 Nor, did I make it on Wednesday when the scheduled intrasquad games were played. However, I was there today. In addition to today’s report, I have observations, photos, and video from as far back as Sunday. Today: I arrived at the Complex around 9:20 AM. The presentation had already begun. 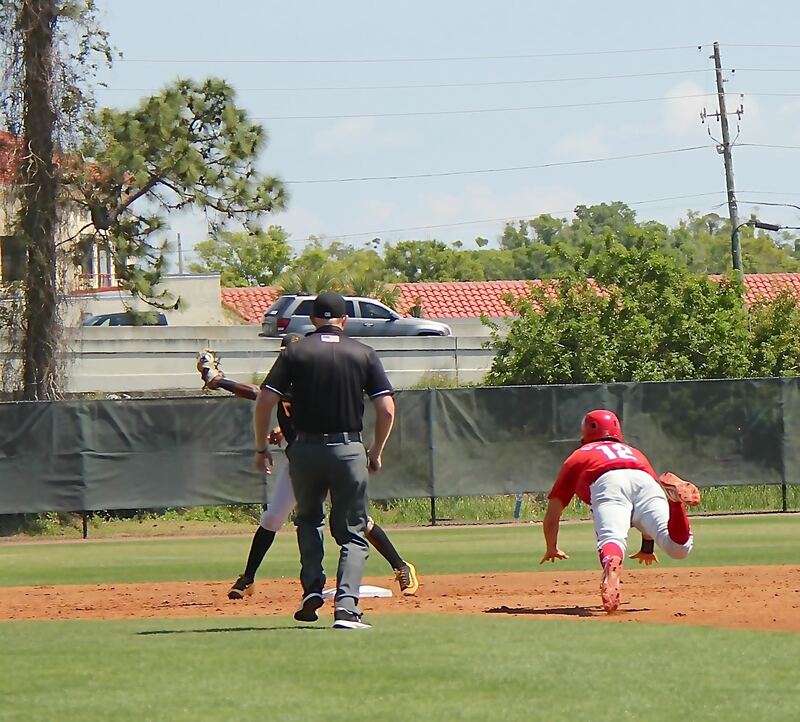 When it was over, the players dispersed to Spectrum Field or to the Complex fields where they were required to report for their drills. I saw an itinerary for the day posted on a clipboard in the dugout on Carlton Field. It appears that they began today at 6:30 AM with the same drills they were going through post-presentation. On paper, they continued with an extensive list of PFPs that competed the first 8.5 x 11 inch page of the list. 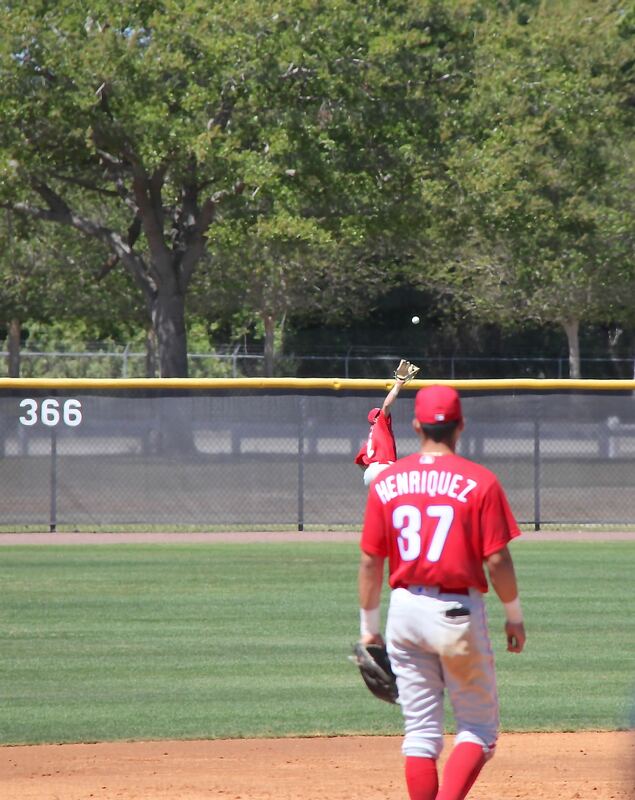 This segment of the workout had the players stretch, toss, and run before the infielders took ground balls during BP. JoJo Romero started in the AA game. He pitched 4.0 innings, gave up one run (on a HR), and struck out five. He was followed by Jakob Hernandez who also allowed a run (on a HR), but struck out four in 2.0 innings. 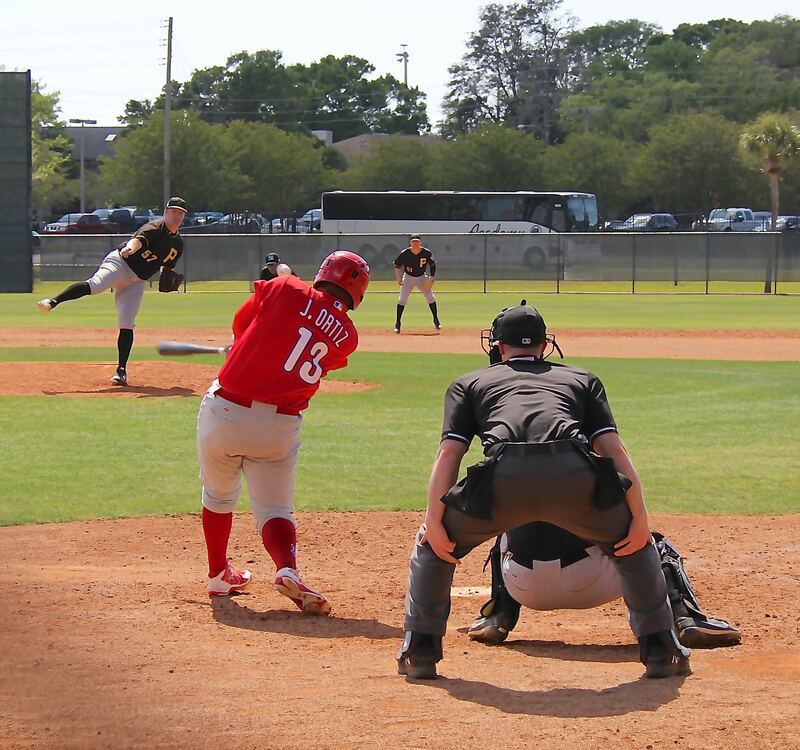 Jake overwhelmed GCL hitters with his 12 to 6 curve ball last year. 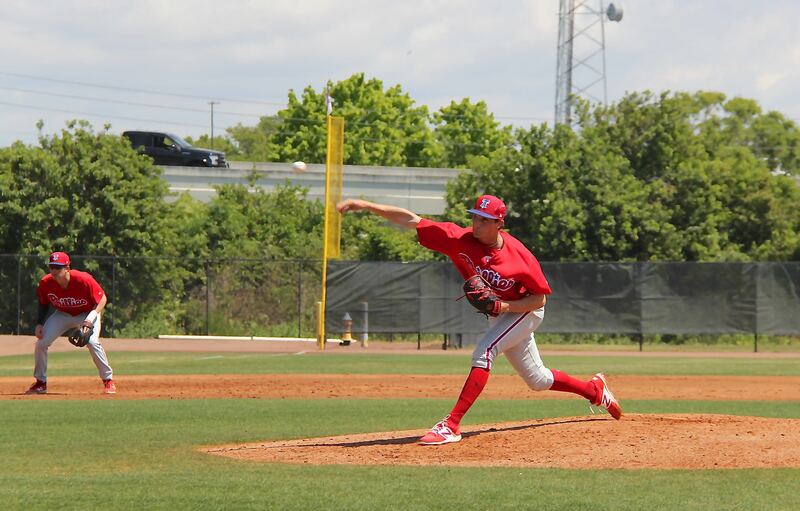 Thursday, he pitched against the Yankees Group Two which was surely comprised of AA and Advanced A batters, a considerable step up from the GCL. He threw his fastball down and moved it around. His curve ball is tighter and has more velocity and glove side break. The HR came on an 0-2 pitch. It was the third FB in succession, was low in the zone, but got too much of the plate. Both Romero and Hernandez had batters flailing over their off speed pitches. In Romero’s case, it looked like a change up. DH Adam Haseley had two hits before I left, a HR and a line drive single to center. 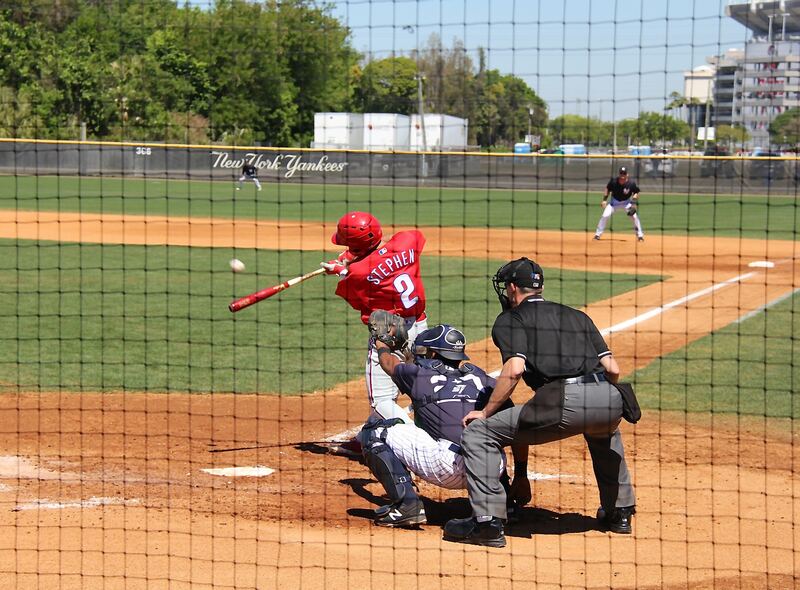 RF Jan Hernandez made some strong contact as did the other DH Wilson Garcia. Our group was leading 9-4 when I left thanks to a 7-run sixth inning. Addison Russ was taking the mound in the seventh. 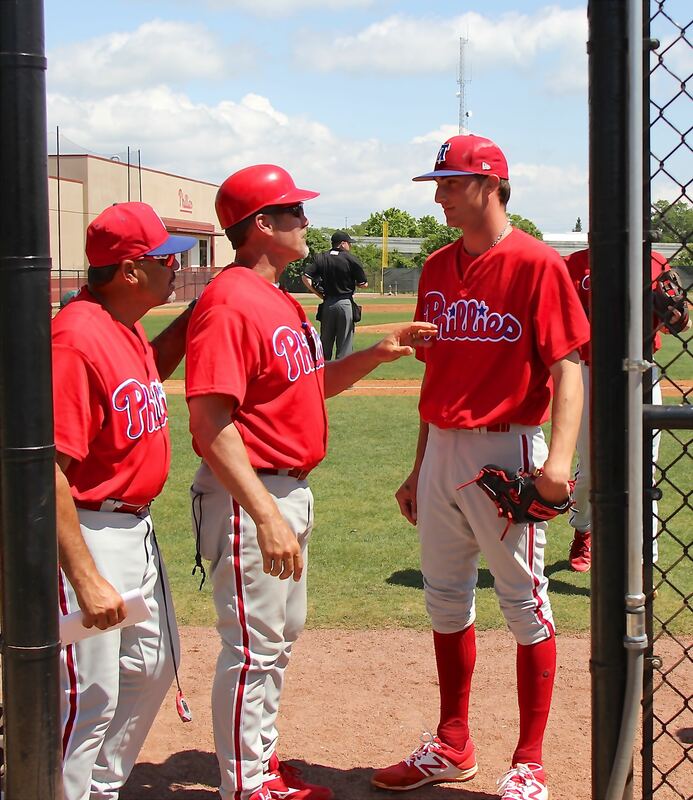 In the AAA game, Tommy Hunter, Ranfi Casimiro, Yacksel Rios, and Tom Windle pitched to a 5-5 tie thru eight innings. Rios gave up the bulk of the runs. Carlos Santana and Cesar Hernandez batted for the group. 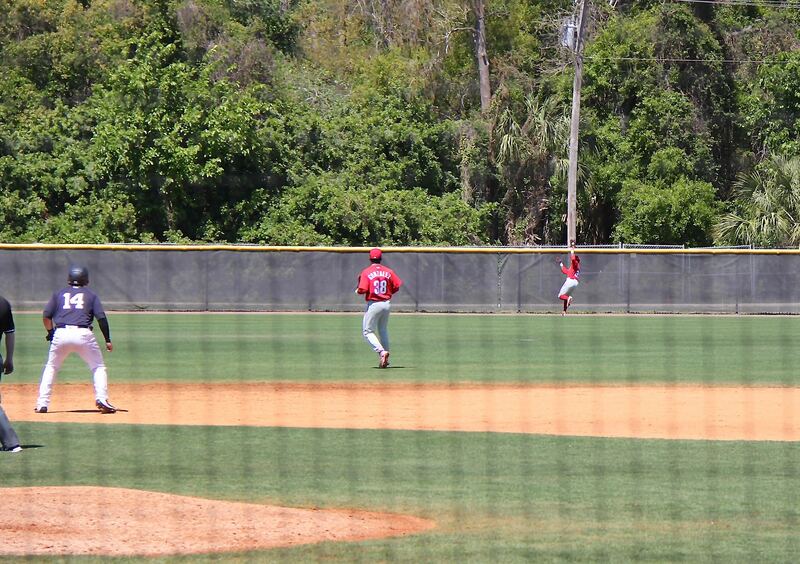 Mitch Walding had an RBI base hit on a double to the left center field wall. Connor Brogdon threw two scoreless innings and punctuated his outing by striking out his final batter. 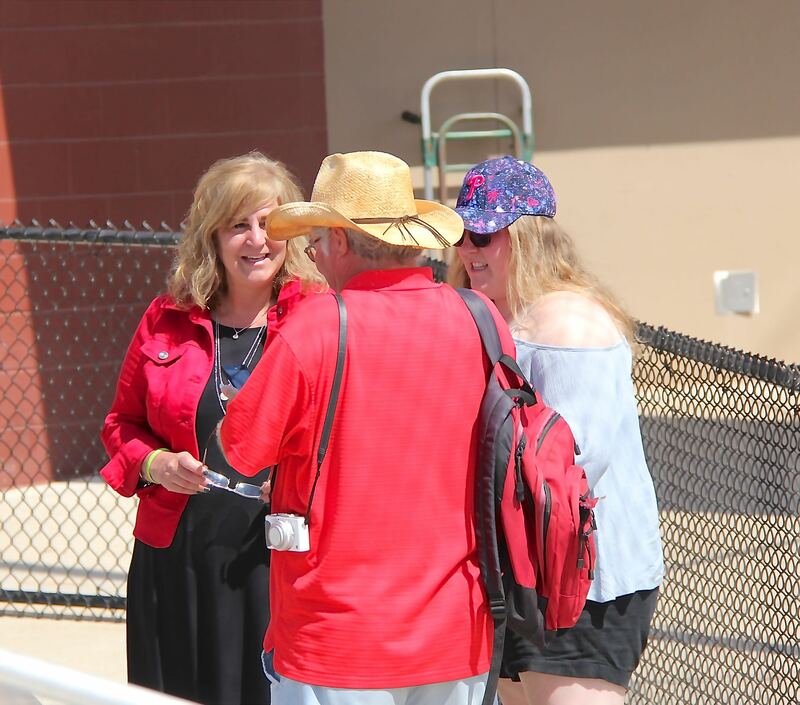 Mark found me talking to Casey Brown’s mother and sister. They were part of a contingent of as many as nine at its largest. 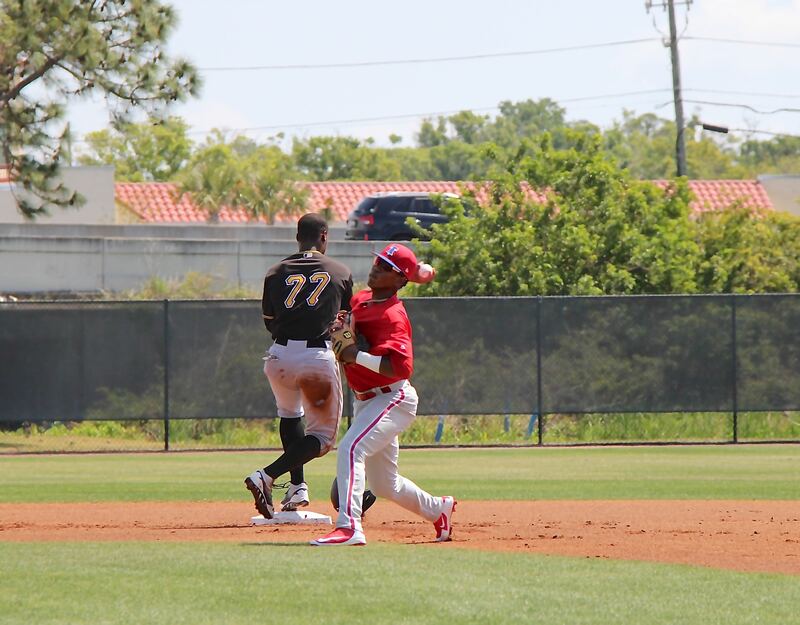 During spring, I have talked to a lot of the players parents – Tom Kingery, the Mayers, the Brogdons, Carlos De La Cruz Sr., Matt Moniak, the Falters, as well as Murray and a LOT of Phuture Phillies readers. March 17: Mark Wylie went to the games in Tampa. Bailey Falter pitched very well – 3.0 innings, 1 hit, 0 walks, 5 strike outs. Roster moves: The Phillies moved closer to their final roster when Ryan Flaherty was given his release. The only question remaining seems to be the make up of the starting rotation. Tommy Joseph was claimed off waivers by the Rangers. Eliever Alvarez was traded to the Rangers for cash. Jake Thompson has been moved to the bullpen. And, they signed some international free agents – C Artero De Freitas (age 16), OF Jose Cedneo (17), LHP Edinso Aleman (17). Jim, any update on Mickey Moniak? 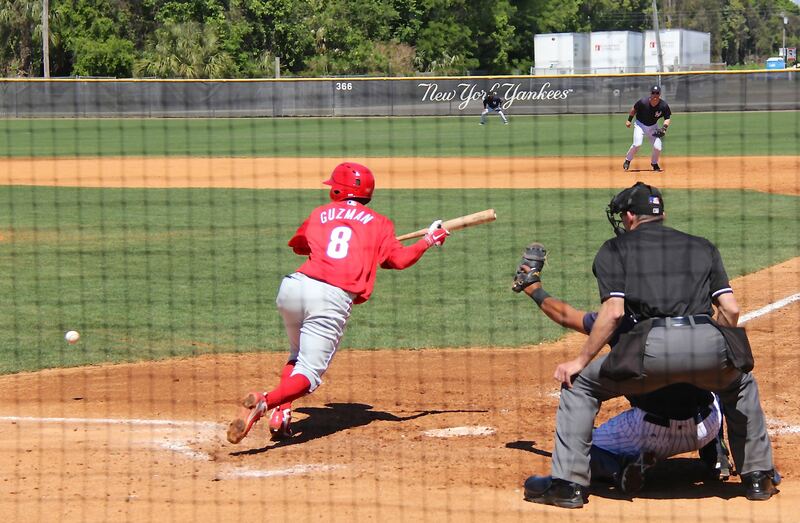 Blogs have mentioned that he was struggling, and was wondering if he got more comfortable at the plate. It’s spring training. Wait a couple of months into the season before worrying about who’s struggling. It appears that Lively will take Eickhoff’s spot and that Thompson might get Leiter’s spot. However Hutchison is still in the mix for both spots. Eflin was awful yesterday coming out of the pen and probably pitched himself into the LHV rotation. Rupp to LHV or release?? Florimon, Valentin, and Quinn might all make the 25 for two weeks but then Arrieta and soon after Kingery will be claiming two of those spots. I’m looking forward to seeing minor league rosters come together soon. Plus Sixto should be throwing soon. Jim – are we doing our step up guys this year? I’ll take Falter. Thanks, Jim. As always, love the Jake Hernandez reports !!! A great and fitting honor to Dave Montgomery. Liked by all, always said hello to everyone. Thanks for taking the time to record and post the videos. Greatly appreciate it!